Thousands of demonstrators gathered in New York City on Sunday to protest President Donald Trump's executive order temporarily banning travel from seven Muslim-majority countries and suspending all refugee admissions. Protesters carried signs that read, "No ban, no wall," "We are all immigrants," and "Christians against the Muslim ban." Chants of "No justice, no peace," and "Immigrants are welcome here" broke out throughout the rally. 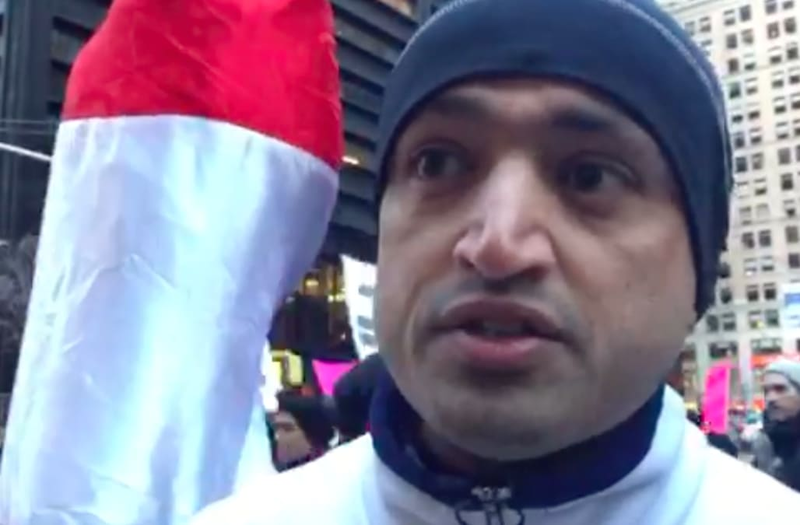 One protester named Abdul Alzindani, an immigrant from Yemen who arrived in the U.S. in 1990, said a conversation with his 6-year-old daughter compelled him to make his voice heard on Sunday. "When your child tells you if Trump asks if you're a Muslim, tell him no... that really shook me," said Alzindani, wearing a U.S.A. jacket. Alzindani asked his daughter why he should lie about his faith and she said because President Trump "hates Muslims, and he wants to kick us out." Alzindani's story is emblematic of the fear many Muslim Americans have expressed following Trump's election, and even throughout his campaign. During his 2016 campaign, Trump issued a declaration to ban the entry of any Muslims into the United States. And while President Trump said on Saturday that his executive order that targeted multiple Muslim-majority countries is "not a Muslim ban," many Americans view it as a campaign promise kept. Former Trump advisor Rudolph Giuliani revealed on Saturday that the president asked him how to "legally" carry out his proposed Muslim ban. "When your child tells you if Trump asks if you're a Muslim, tell him no... that really shook me." Trump released a statement on Sunday claiming, "This is not a Muslim ban, as the media is falsely reporting." "This is not about religion -- this is about terror and keeping our country safe," Trump said. However, for many protesters, including Alzindani, Sunday's march provided an opportunity to stand in solidarity with like-minded people from diverse backgrounds. "This is America. It's not what Trump stands for. This is why America is the greatest country," said Alzindani. "For us to start banning them from coming into our country after we bombed their countries repeatedly is frankly irresponsible and disgusting," said Ayesha, a Muslim-American who came out to the rally for her family and friends. Organizer Murad Awawdeh, Director of Political Engagement for NYIC, said that while he felt Sunday's event was a success "We are gonna have to continue staying on the streets." "We are going to have to continue fighting because this is not over," said Awawdeh. According to rally organizers, 30,000 people took to the streets on Sunday in downtown Manhattan, and with Lady Liberty off in the distance, New York City Mayor Bill De Blasio, New Jersey Senator Cory Booker and New York Senator Chuck Schumer, among others, delivered passionate rebukes of the new president's first week in office.